Work in Progress... Part 1: Crochet! I cannot say it enough, I love project bags. Small enough to throw in a purse on my way out the door, but big enough to hold all of the supplies I need for crochet-on-the-go. I tend to work in phases, and it helps me to stay organized when I keep the yarn and hook and pattern all together when I have to put a project aside for a while. Then I know I've got everything there when I am ready to pick it back up again! I am fascinated with nylon yarn. It doesn't behave the way that cotton, wool or acrylic do, the fibers don't blend together. The stitches are smooth and even the tightest stitches leave lacy stitches and hole-y fabric. It's heavy and it's slippery. The ends unravel. I got some Iris Nylon Thread (size 18) to make a project bag. I wasn't sure what I had in mind, but I wanted something with a zipper, and maybe handles. 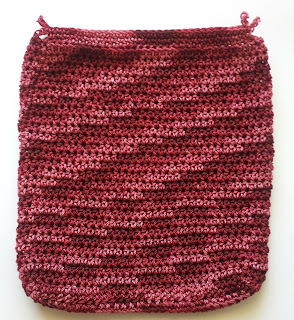 I wanted a one-skein bag, since I only bought one skein of this color... 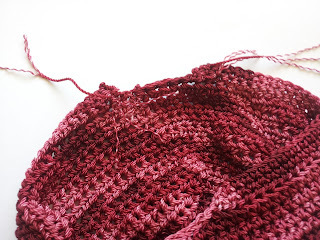 I got to crocheting, and 197 yards is just not much to work with. I frogged several designs, since I was at the end of my skein before I was even halfway done with my bag. My bag was going to be a lot smaller than I had thought it would be. This was going to be a bag for delicate projects. That was okay with me, I am still on my size 3 crochet thread kick. My current projects tend to be small anyway. 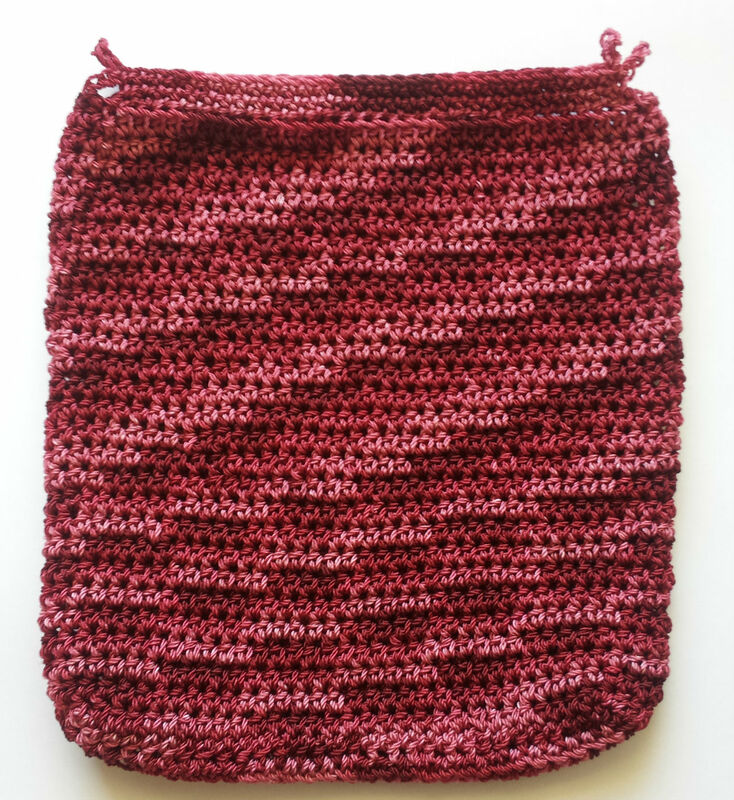 The crochet part of this bag is really straightforward and simple, but the zipper instructions are a little image heavy, so I'm going to break this project up into two parts: The Crocheting Instructions, and Installing the Zipper. Most of the crocheting is just working hdc stitches in the round. 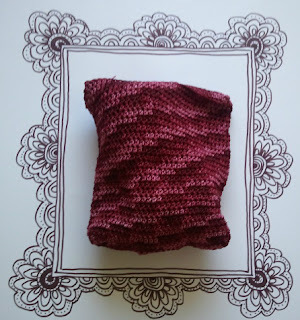 I made the flaps in (what I would consider) a rather unconventional manner, so I would recommend reading through the pattern before you start. If you have any questions, please feel free to email me at CrochetDynamite (at) gmail (dot) com. So, if you'd like to make a Work In Progress bag, grab your supplies and let's get going. *a side note: don't add extra stitches to the corners, we don't want the bag to flare out, we want it to go straight up from the base. Fasten off, leaving a few inches of yarn tail. We're not going to weave the ends in, exactly, but we are going to move them away from the edge of the bag flaps a little. So, use your yarn needle to pull the end through a couple of stitches, so the frayed yarn end is now on the inside of the bag. Make sure the starting yarn tail is on the inside as well. Now, READ THIS CAREFULLY: You are going to cut the chain loops from the flap rows. Only cut through ONE strand of yarn, halfway between the two flaps (which would make it the 5th or 6th chain). THEN, unravel the chain back to the crochet fabric. Stop before you unravel your flap! Use the yarn needle to weave the unraveled chain back into the flap a few stitches. It's going to look bad at this point, but the next step will clean it up. Trust me, dear Dynamos! I would never steer you wrong! You will be cutting, unraveling and weaving the end into the inside of the flap for all four of the chain loops (8 frayed chain ends, plus the start and end tails, will give you total of 10 ends to be dealt with). This next part is slightly dangerous. If you are a Junior Dynamo, please get an adult to help while you do this next part. Grab your matches, or lighter, and your scissors. We're going to melt the ends of the nylon so that they don't unravel or fray. *Go slowly. Only do one thread at a time!! Open a window so that you aren't inhaling the fumes! Snip the thread, leaving a 1/4" tail sticking out of the fabric. Melt it with the matches, letting it melt into the stitches around it. This is a quick process. Don't worry if the stitches around it get slightly melty. (Just don't touch them!!! They are super-hot melted plastic, and it will stick to your skin and burn you.) The melted end will cool into a little hard blob of plastic that will never come loose. Yippee!! edit 6/21/12: This is the post where we put the zipper in! Any Ravelry experts out there? The WIP Bag, Part 2 - Put in the Zipper! Same Bat Time, Different Bat Channel!